"Cybercrime and cyber-terrorism represent a serious challenge to society as a whole." - Hans Christian Krüger, Deputy Secretary General of the Council of Europe Crime has been with us as long as laws have existed, and modern technology has given us a new type of criminal activity: cybercrime. Computer and network related crime is a problem that spans the globe, and unites those in two disparate fields: law enforcement and information technology. This book will help both IT pros and law enforcement specialists understand both their own roles and those of the other, and show why that understanding and an organized, cooperative effort is necessary to win the fight against this new type of crime. 62% of US companies reported computer-related security breaches resulting in damages of $124 million dollars. This data is an indication of the massive need for Cybercrime training within the IT and law enforcement communities. 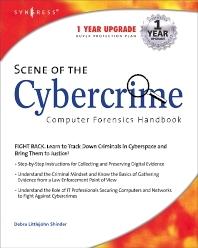 The only book that covers Cybercrime from forensic investigation through prosecution. Cybercrime is one of the battlefields in the war against terror. Network administrators and other IT professionals who need to know how to protect their organizations' computers and network. Law enforcement professionals who need to know how to collect and preserve digital evidence, how to locate cybercriminals, how to deal with jurisdictional issues that complicate the prosecution of cybercrime.